Perfect 3CH ECG(Std.) and 12CH ECG(Opt.) Will make you ECG analysis specialist. - ST Segment analysis permits simultaneous viewing, adjustment, and monitoring 12 ECG leads. Helps you to manage total quantity of drug to be delivered to the patient over time. Recalls 20 seconds event data with graphic, and 2 sec-long data can be zoomed to observe and analyze. You can see 2hrs-long mini-trend data on the main screen. 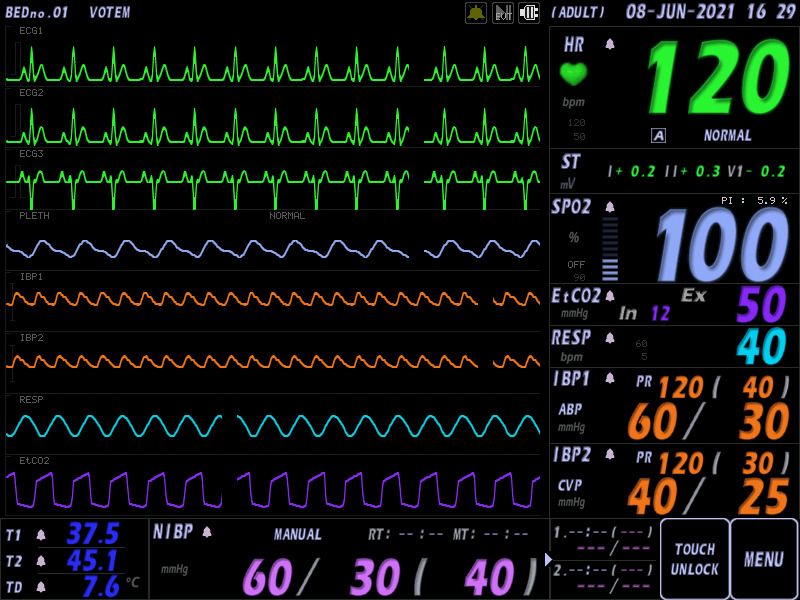 Measures Cardiac Output (CI, SV, SI, LVSW, LVSWI, RVSW, RVSWI, SVR, SVRI, PVR, PVRI) Selectable color configuration of waveform and numeral for all parameters up to 18 colors. NIBP can be measured from 5 to 15 minutes automatically. Analyzes patient’s HR, SpO2, Resp., for each 0.3second during 2 minutes. Stores patient’s admission date, ID, name, gender, date of birth, weight, and height. Manages individual EVENT data up to 20 cases in case of Arrhythmia. - 10,080 sets(1 set per minute) of virtual signs list data can be stored, reviewed, and printed out. Able to UPGRADE S/W CONTINUOUSLY WITHOUT DISASSEMBLING THE PRODUCT WITH SD CARD.